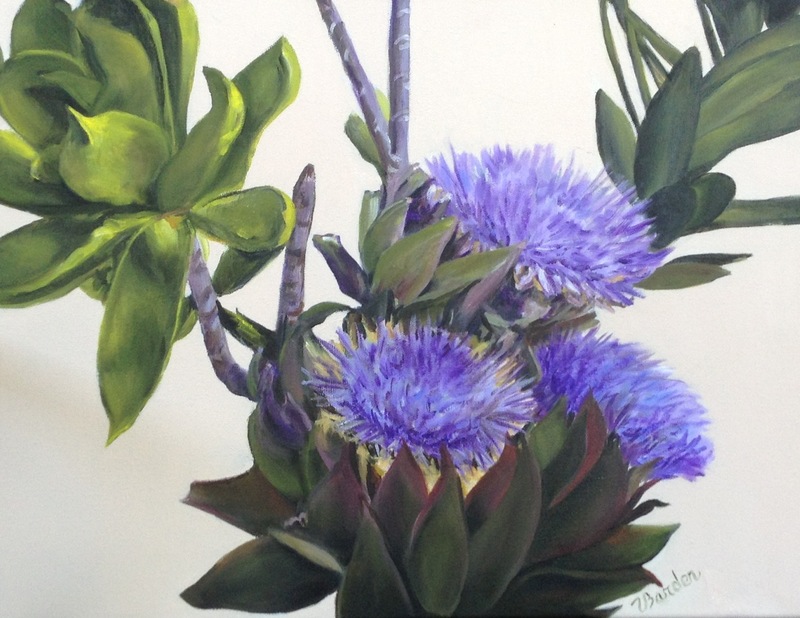 The Garden Art Group has been exhibiting for almost 50 years. 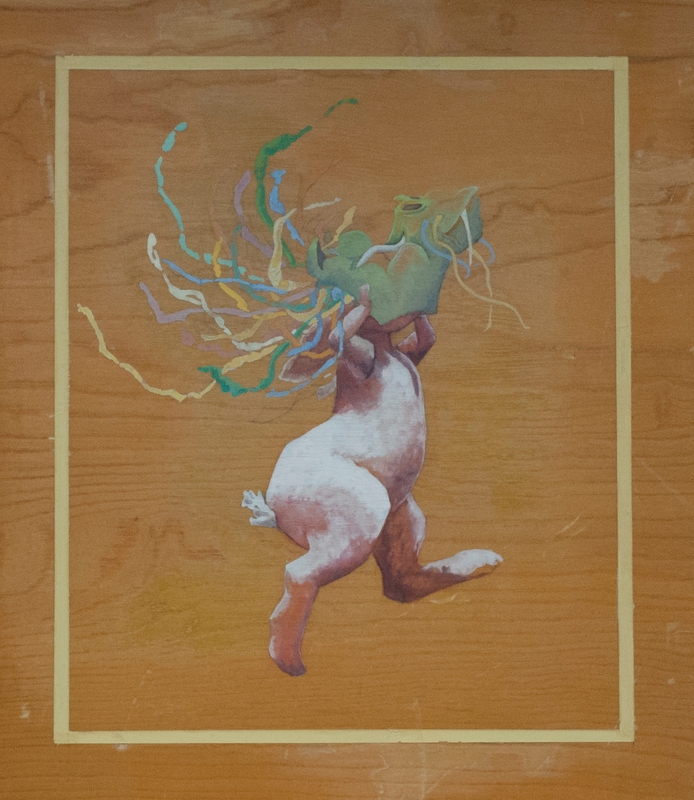 Barbara is working on a series of rabbit paintings in gouache exploring the idea of masks in everyday life. Misty Mulleneaux came to the Phoenix area over twenty years ago from Ohio. She received her formal training in art from The Art Institute of Pittsburgh, but has never stopped learning and growing. 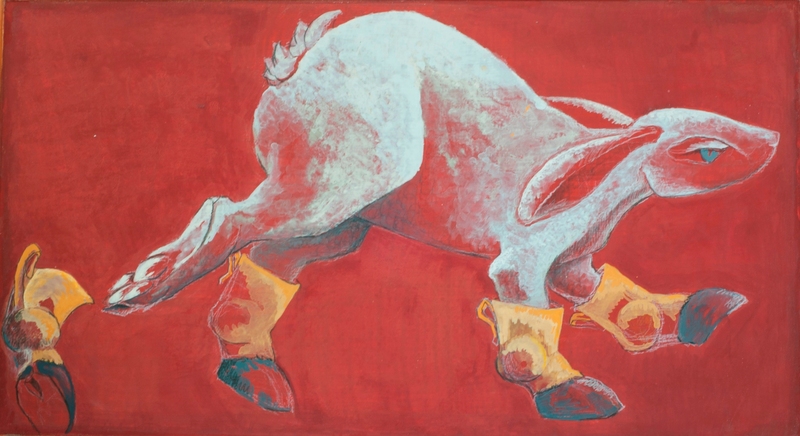 Upon moving to the southwest, she immediately found her work influenced by the bright light and color of the desert. 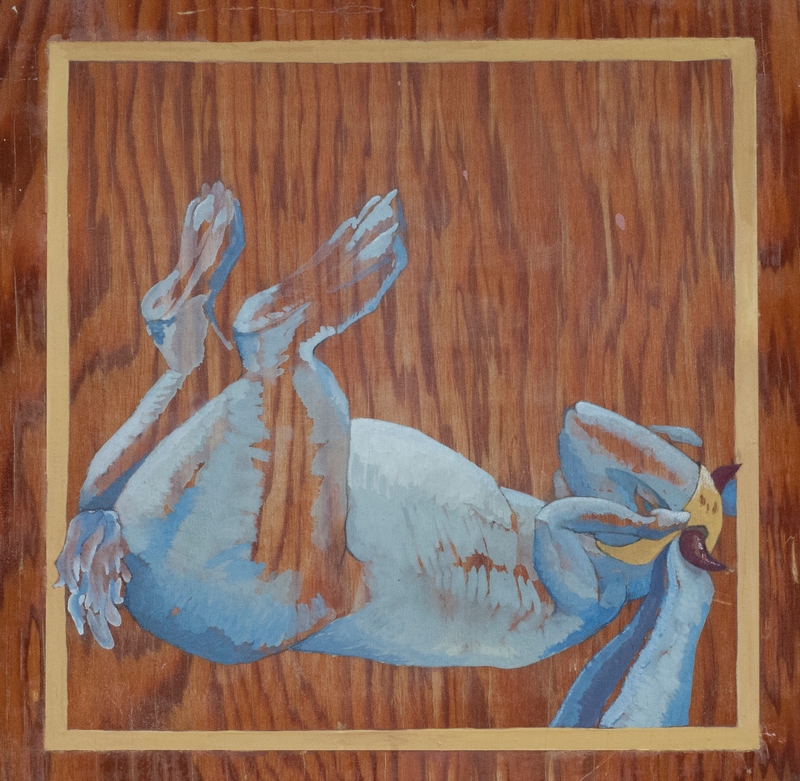 This palette is reflected in her paintings of interior scenes, adobe buildings, and animals. 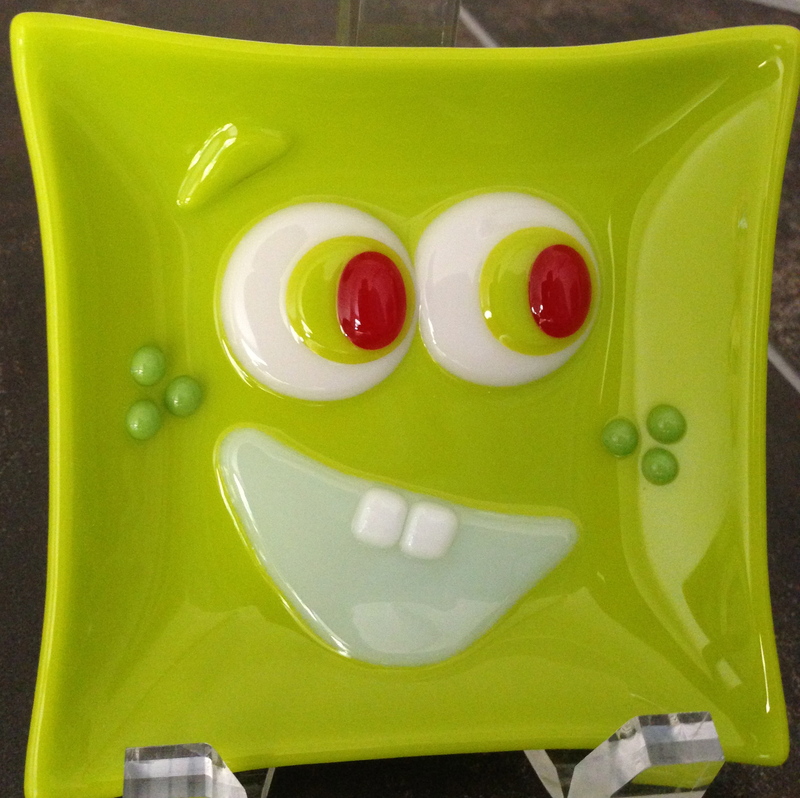 There is a cubist influence running through much of Misty’s work in both paintings and sculpture. Her paintings have brightly colored fractured depths, and her sculptures also take on cubist shapes and leaning elements. 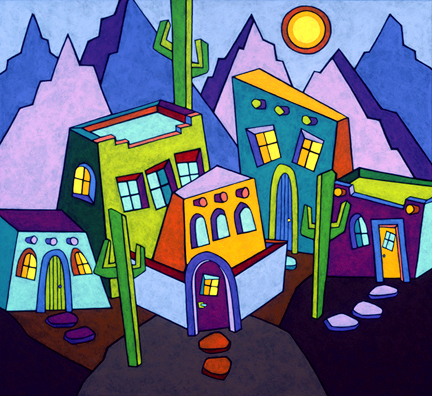 Her southwest paintings marry her love of architecture and the desert. While the composition is filled with cacti, trees, buildings and even hills leaning near the edge of collapse, the “whole” is completely balanced and brought together by her use of color. She excels at orchestrating many pieces in motion to produce a completed artwork that will forever keep the interest of the eye. Also, check out “Griffiti” on Misty’s website – a tribute that all pet lovers will appreciate. 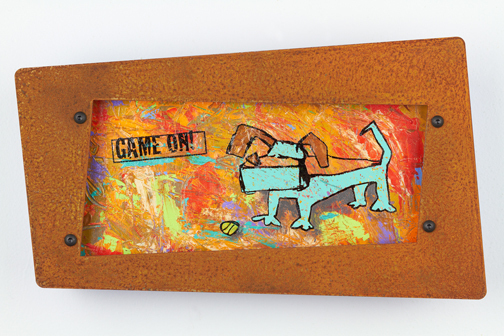 She will be at the Art in the Garden Show and Sale at Shemer on March 15th with both her paintings and her sculptures. Her paintings range in size from 6”x6” to 30”x40”. 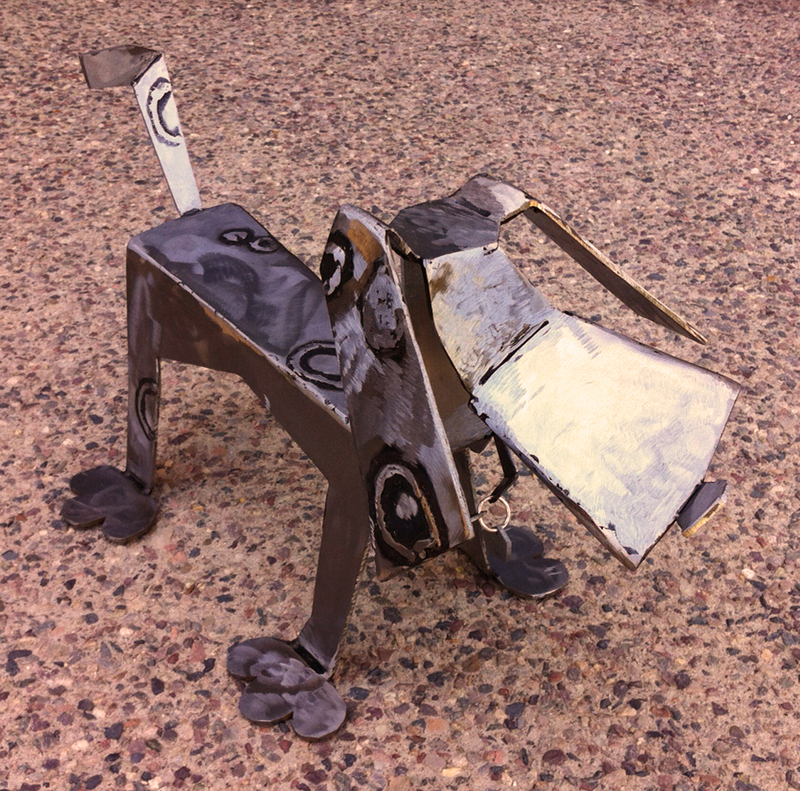 The sculptures range from roughly 8” square up to 36” square. Popular Microdwelling Exhibit Returns to Shemer Art Center & Museum! Once again, MicroDwell will fill the beautiful 3-acre grounds of the Shemer Art Center with microdwellings of 600 square feet or less, often utilizing recycled materials or found objects, and reflecting a more sustainable form of architecture. At least 14 dwellings are planned to be constructed on-site in advance of the February 15th opening. The event will run through March 23rd, and will include several special events, lectures, and demonstrations on sustainability and living small. Also coming up at Shemer….. Please be our guest on the opening day of MicroDwell 2014 and enjoy wine tastings presented by Cellar 433 of distinctive handmade wines from AZ Angel, Dribble Creek, Fiddleender, and Jerome Winery. On Sunday, beer tastings will begin at noon with the following breweries: Four Peaks, Sleepy Dog, Mud Shark, Mother Road and Prescott Brewing Co. Food trucks, Dog & Tacos, will also be on-site. The weekend of March 1st & 2nd, the Shemer will feature micro urban gardening in the microdwellings! Come and see local vendors, nurseries, and artists who create garden art! Lectures & demonstrations throughout the day. 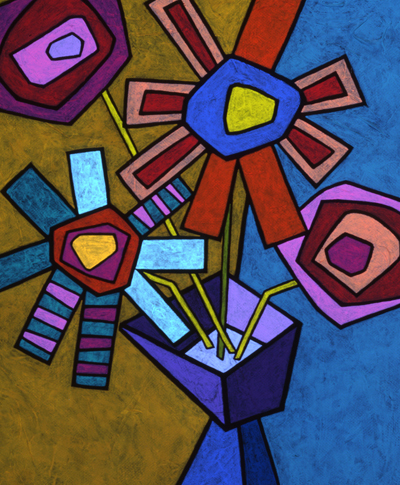 Now in its 49th year, this spring tradition features 20 artists working in watercolor, oil, pastels, printmaking, jewelry, ceramics, fused glass, quilting and sculpture. Artwork will be for sale. Plus, there will be live music, and light refreshments A raffle of 20 special works will be held to benefit the Shemer Art Center’s education programs. The event is family friendly and open to the public. The closing weekend of March 22nd & 23rd will be our Family & Pet Days. Activities will include interactive art activities made with repurposed materials as take-home projects. Learn to design a pet dwelling, too! 2014 Garden Artist Postcard is OUT! This 16×20″ acrylic “Dog With a Pearl Earring” received an Award of Excellence in the Arizona Artists Guild Juried Members Show that is up until mid February. 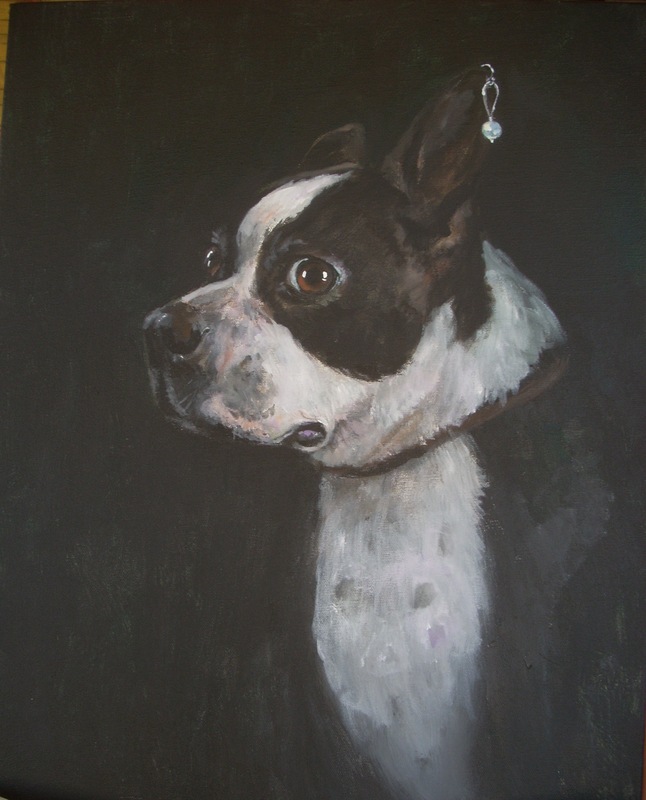 I was inspired by Vermeer to paint my dog Kelli who is a rather serious dog. 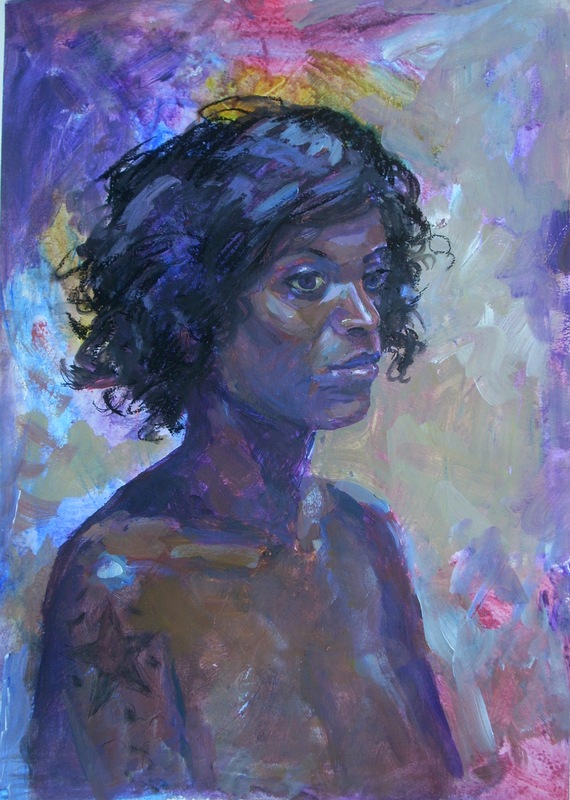 Vanessa was painted at a life drawing session and is also in the AAG (Arizona Artist Guild) show. I enjoy using acrylics when I paint because they are fast drying and love the water clean up. 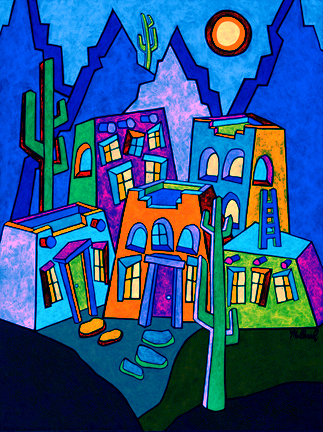 I have a studio in the Artery Building at 7th Street and Indian School that is open on First Fridays. Come down and say hi if you are downtown Phoenix. 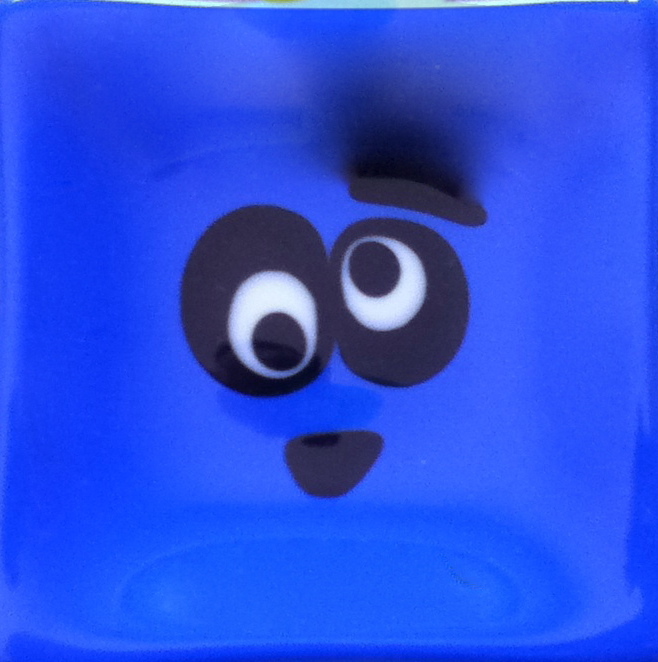 The skull is 12×12 fused glass. I have been working on Day of The Dead skulls for the past couple years. 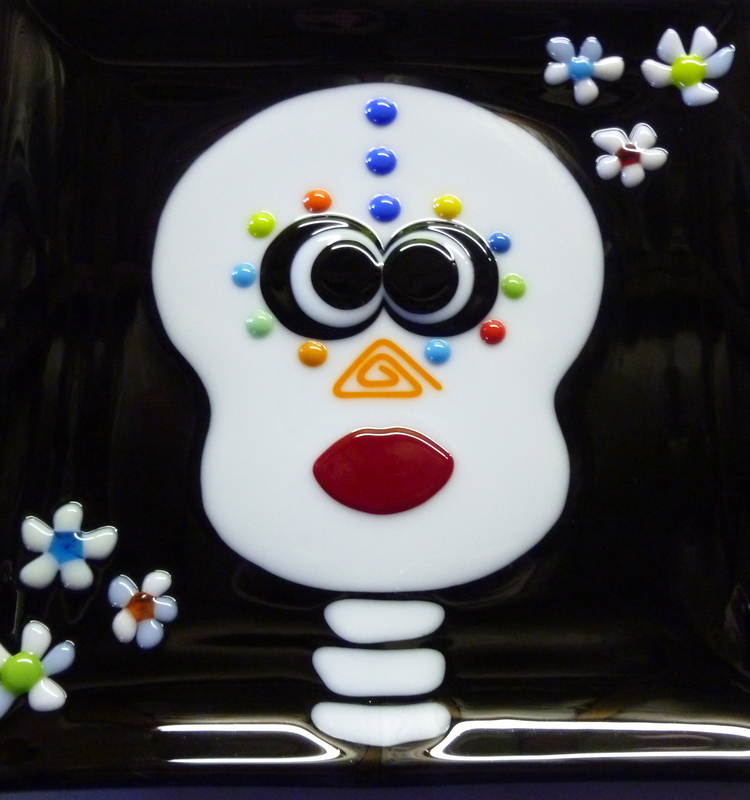 I find the sugar skulls so interesting I just had to try them in glass. 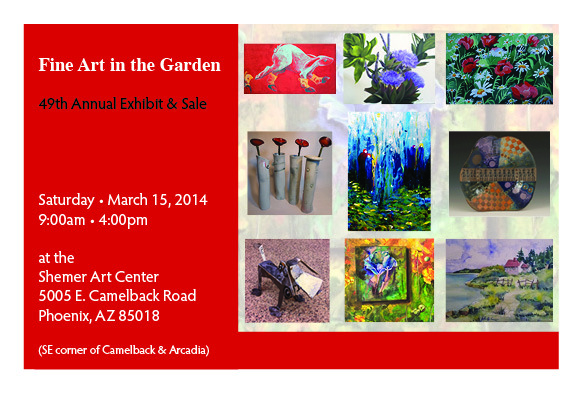 2014 Garden Art Show Invitation! jewelry, ceramics, fused glass, quilting and metal sculpture. programs. You do not need to be present to win. Free Admission.